Go back, right now, and take a look at my Zyka India Food restaurant review. Notice anything suspicious about the Chicken 65? Take a closer look at those ingredients. Jalapenos. Onions. Cilantro. Sound familiar? If you’re from Texas or anywhere in the Southwest you would immediately associate that combination with Mexican or Tex-Mex cuisine. There are other similarities, too, like the general spiciness, the use of chilis, or the penchant for using circular flatbread at every meal to sandwich ingredients and sop up sauces. This was recognized by my Indian friends, too. They told me about a legend they had that back a long, long time ago some Indian king had succeeded in tunneling through the earth, and wound up in Mexico. As the story goes, he then primarily used this tunnel to share recipes with the folks he found on the other side of the earth (Something like that. The details are sketchy at this point.) And that, son, is why peppers are eaten in both Mexico and India. I recall thinking to myself that this could work — not the tunnel thing, but that you could tweak the flavors and ingredients of Mexican cuisine to give it an Indian flare, and that (according to my calculations) the result should rock. So I filed my million dollar idea on the shelf next to all the others and quickly forgot about it. That was 10 years ago. Well, while I was sleeping somebody was raiding the shelf. Located in Coppell, Texas, Taco Naan is the realization of my old dream. I first ran across it while scouting a nearby geocache. The storefront is pretty unassuming — even verging on the dive-y. My geocaching buddy Jambone was hesitant to step in to the place, but I didn’t think it looked that bad. I’ve certainly had good food at worse looking places. Still, it gave the overall impression of a newish restaurant gone a little to seed. Once inside I noticed a back door behind the register that opened directly into the alley, which reinforced the impression that the building itself was cheaply constructed, one of those steel frame boxes that people like to turn into pre-fab houses for a few thousand bucks. The seating area was small, but adequate for the business. I think there were two or three other people eating lunch. The register and menu stood opposite the entrance. Jambone and I walked up to place our orders. I was curious to get a look at what they offered, at the kinds of dishes and combinations they imagined. Judge for yourself. Here’s the menu. 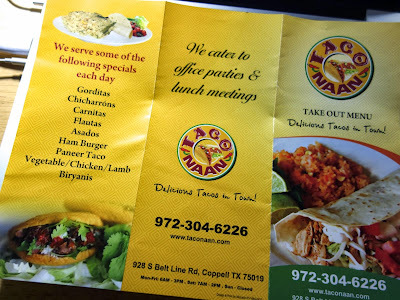 The slogan is apparently “Delicious Tacos in Town!”, which is (perhaps unintentionally) modest. I was disappointed on reading the menu that it was basically a pretty standard taco shop, with a few Indian influenced offerings. One item that immediately stood out to me on the menu was the Lengua Taco, which is beef tongue. This was a dish I am well familiar with, having grown up in South Louisiana. My dad makes an excellent beef tongue gravy that I fondly remember from childhood, though he and I were the only ones that ever ate it. I understand it’s popular with Hispanic cultures, too, so this is definitely one item that I was interested in trying. The Bagara Bowl seemed tasty, but it was more of a straight-up Indian dish and I wanted to get a real sense of the culinary fusion. In the end I asked for a recommendation from the helpful and courteous lady at the counter, and she suggested the daily special, the Chicken Naan taco, which I ordered with Chicken 65 and a side of rice and beans. While filling up my soda I noticed something like a buffet bar behind a counter overlooking the kitchen filled with Indian dishes of various sorts. Everything looked and smelled wonderful. By now my appetite was whetted, and Jambone and I shot the breeze while we waited for our orders to come up, which didn’t take long given the lack of crowds. Mine arrived first, and after removing the tin foil wrapper from my taco I studied the plate. I was a little disappointed. The naan bread appeared to be nothing more than a pita, and the large slice of tomato added to the impression that I was going to be eating a Mexified gyro. The rice looked clumpy and unevenly colored. The refried beans lacked the topping of shredded cheese shown in the pictures, and while they never look all that appetizing under the best of circumstances, these seemed particularly gloppish. Undeterred, I dug in and was immediately surprised by how enjoyable the taco actually was. The naan bread, though very pita-like in appearance, tasted wholly different than that Greek flatbread. I was expecting chewy and doughy, and what I got was a soft, melt-in-your-mouth smooth dough that cut easily on the teeth, lightly toasted with a millimeter thick layer of buttery crust, just enough to give you that hint of toasty crunch in every bite. The meat was unimpressive by Zyka standards, just little pieces, but adequately proportioned and well seasoned. The flavor was all Indian. The “fusion” part came with the lettuce, tomatoes, cheese, and sour cream that filled out the taco. It was enjoyable start to finish, and left me curious about their other taco options. The rice and beans, though, were a different story. 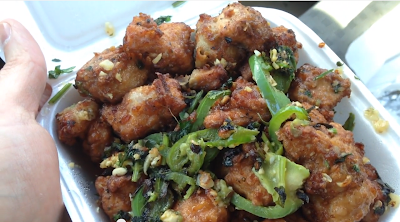 I got the sides to try to augment the fusion quality of the meal, but I was greatly disappointed in the quality. They tasted no better than they looked. The rice was clumpy and gummy. The beans were bland and tasteless. Both were tepid, flavorless, and unappealing. Sad, too, because I’ve always held a plate of rice and beans to be the best indicator of the overall quality of any Mexican restaurant. These didn’t speak well of the place. Absolutely. For five or six bucks I got a soda, a killer taco, and some lackluster sides. Disappointing as they were, I figured next time I could just skip the rice and beans, or better yet, try the Biryani. 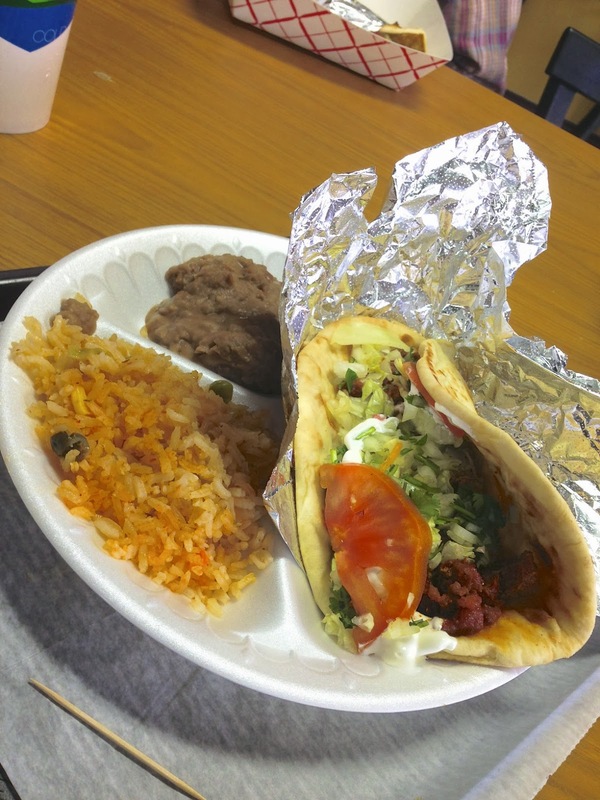 A couple of dishes still called to me, like the Taco Lengua. They place could use some sprucing up, maybe, and a bigger disappointment is the lack of imagination evident in the menu. It just doesn’t have enough of a fusion quality to it, in my opinion. 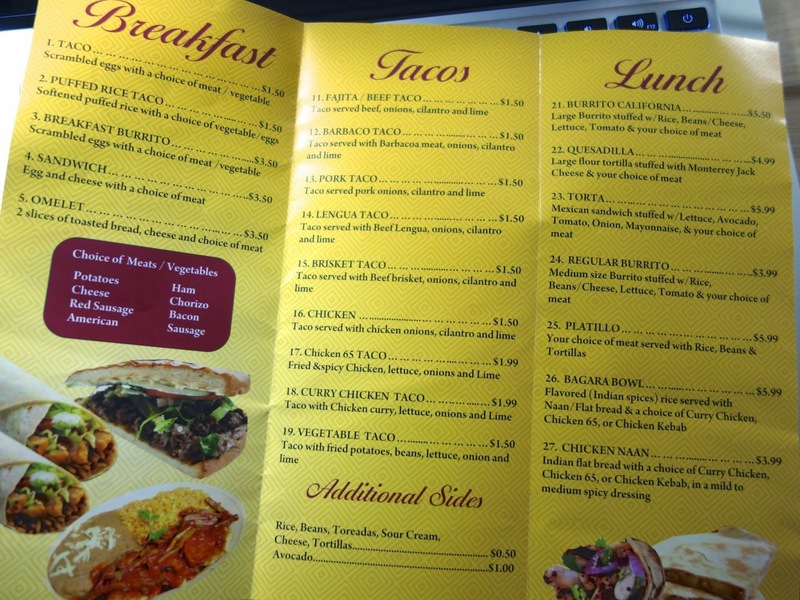 The menu is something like 70% Mexican, 20% Indian, and maybe 10% truly “mixed”. Still, though, they have a winning idea. All the ingredients are there. 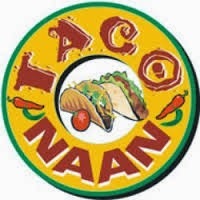 They call themselves Taco Naan and they deliver on both the Taco and the Naan. And that’s a good start. 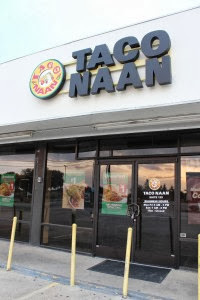 I’ll be returning to Taco Naan, because if nothing else they count as the only fast food Indian place I can think of.